Turmon is prepared for their exciting annual auction with over 600 lots spread over two days of bidding. A wide variety of Western collectibles are coming through the auction including firearms, knives, bits, spurs, saddles, Native American pieces, blacksmith anvils, antiques, horse drawn collectibles, art and western deco, and much more. This is one of the best they have ever presented in company history and bidders are lining up to add to their collections. A pair of Winchesters are featured at Lots 75 ad 76 on the first day of the auction. Lot 75 is an 1892 saddle ring .44 with 16 inch barrel and a scabbard. The serial number is 169523. Up next is Lot 76 that presents an 1892 .38-40 with a half octagon barrel. Manufactured in 1907 this carries serial number 300385. Both rifles have photos in the online catalog and are ready for bidding. 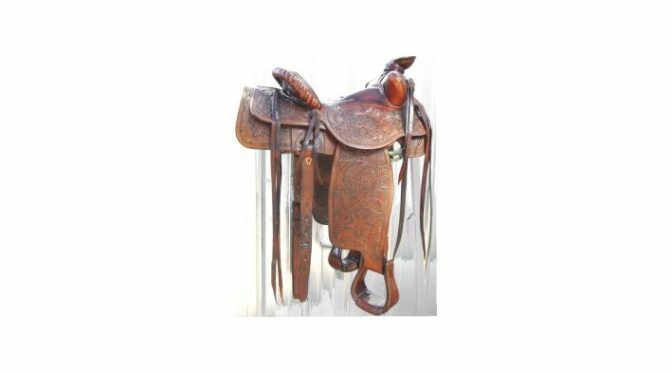 Lot 221 brings a highly collectible saddle to the auction block. Featuring on the second day of the auction, this is a Severe Bros, Pendleton, full tooled saddle. It has a 15 inch seat, a double rig, and is in great condition. Bidding opens at only $400 and this is valued as high as $1000 for collectors. The photos are up for inspection. A one of a kind offering is available at Lot 250. Turmon Auction Service is showing an early double mounted California style pair of spurs in a transitional pattern. They were made for R. Ellyson “Tex” Ewell and the rowells are marked “Text 1926”. Included is an attache case with a picture of Tex wearing the spurs, his 1917 US Calvary discharge papers, a hand written will, a 1905 Sunday School membership, as well as a Calvary Dec 1, 1916 document. This document has pages of hand written experiences, instructions, etc and there are also some early western books. This truly historical package is a great buy at auction filled with primary sources of history. Bidding opens at only $500 for this truly special auction offering. Friday May 11th, 2018 kicks off live bidding at 4:30PM and Saturday May 12th, 2018 opens for bidding at 9AM in the morning. Turmon Auction Service is delighted to answer questions about their pieces; they have worked hard to consign and build this collection for sale. They can be reached via email or telephone and absentee bidding is currently available. Be part of the live auction on both days and enjoy one of the best traditions in the auction business with Turmon’s Annual Auction.